Here are a couple of shots that I dug up a few days ago. They are both from the same roll of film, shot back in 2004. Cross processed. (These colors are 100% Photoshop free. They come from the processing of the film). On camera flash on the bottom one... I have learned a lot in the last 5 years. 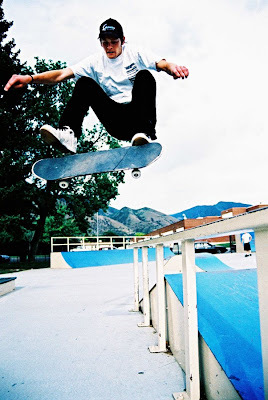 David Law, home court advantage--frontside flip at the Springville park. Jon Hart--skating this set at night is ridiculous. Ollie. There's Matt filming! Jon rips and I like the colors. I'm digging getting to see your archives.